LANALLAH __Islamic BlogZine__: Why would Allah forgive a big sinner like me? lt is reported by a trustworthy man of the past that as he was passing through a street he saw the door of a house open. A woman came out with a child who was crying and pleading while she was pushing him out. She left him outside the house and slammed the door shut in his face. The child left the door and walked a distance. Then he stopped, looked about, began to think, and not finding any other place but his own house where he could take shelter nor anyone who would care for him as his mother would, he returned to his house dejected, sad. He found the door shut. He sat at the sill, put his cheek on the threshold and slept with tear marks on his cheeks. He was in this state when the mother opened the door. When she saw him in this state she could not control herself. She bent down, grabbed him to her bosom, began to kiss him and say in tears: "Oh my boy! My dear child! My very soul! Where were you? Didn't I tell you not to disobey me? Do my bidding, and don't force me to punish you, while I hate to do that." Then she carried the child back and closed the door behind her. That is the story of a mother and a child: the story of disobedience, punishment, return, forgiveness and unbound love. But the Prophet, salla Allah u alihi wa sallam, has told us that: "Allah loves His creation more than a woman does her child." In fact, there is no comparison between the love of a mother for her child and that of Allah whose Mercy encompasses everything. Allah, azza wa jall, is immensely pleased with a man when he repents and turns to Him. And we shall never be deprived of anything by a Lord who is more pleased with the repenting man, than that man..
"..who was traveling through an arid land. He dismounted and took shelter under a tree seeking some rest. He lay there with his beast, loaded with food and water, at his side. But when he awoke, lo! The beast was gone! He began to search for it frantically. He climbed a hill but couldn't see a trace of it. He climbed another hill and still no trace of it. Finally, when hunger and thirst overtook him, he said, 'Let me go back to the tree, and lay down there until death overtakes me.' So he went back to the tree, and lay there with eyes closed - in total despair. And lo! As he opened his eyes and raised his head, there the beast was, right before his very eyes, with all the food and water loaded on it intact! He rushed to it and picked up its halter. (Can you imagine his happiness) But lo! Allah is happier with a man when he turns to Him seeking His forgiveness, than the man who found his beast when he had lost all hopes." Know it, my dear brother, that true repentance of every sin also brings with it humility and devotion to Allah, and that pleading of a penitent is very dear to Allah. So that what follows after repentance is obedience of a greater degree to the extent that sometimes Satan regrets that he enticed him into that sin at all. That is why you will see that those who repent become very much changed personalities. Allah does not abandon a man who comes to Him a penitent. Compare the situation with that of a father who used to look after his son with great love and care, providing him with the best of clothing, food and toys. Then one day the father sent him on an errand. But, as the boy was walking an enemy took hold of him, tied him and carried him away to the land of the enemies. There his master treated him exactly in the opposite manner. So that whenever the boy remembered his father and his treatment, his eyes swelled with tears, and the heart with pain. He was in this condition of ill-treatment at the hands of his enemies, when their caravan happened to pass by his father's place again. As he looked around he found his father standing nearby. He ran to him and threw himself at him crying "My father! My very father!". His master followed him and was trying to pull him away, but the boy clung to his father, refusing to let him go. What do you think of this father? Do you think he will abandon him to the enemy, refusing to take back the child? If not, then what is your opinion of the Lord whose love of His creation is greater than the love of a father for his child? When a slave of His runs away from his enemies, and throws himself at the threshold of His door, rolling down in dust before him, saying: "O my Lord! 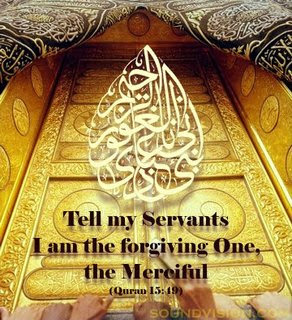 Have mercy upon him who has no one to show Mercy save You, no Helper save you, no refuge save You, no Savior save You, I am Your slave, in Your need, dependent on You, beggar at Your door, You are the refuge, with You is the shelter, there is refuge but with You, nor escape from You except to You" then surely the Lord is not going to turn him back empty handed. Come along then. On to the good deeds, to virtuous living, in the company of the righteous, steering yourself safe from deviations after the right direction, and misguidance after guidance. And Allah is with you.